Global sales of the Prius line more than doubled during the first quarter as Toyota extended the name to a four-model "family" of vehicles, including the Prius "c", pictured. LOS ANGELES -- Toyota Motor Corp.'s Prius, a niche oddity when it went on sale 15 years ago, jumped to the world's third best-selling car line in the first quarter as U.S. demand and incentives in Japan turned the hybrid into a mainstream hit. Prius sales more than doubled as Toyota extended the name to a four-model "family" of vehicles at the same time that rebates and tax breaks in Japan are saving buyers the equivalent of $2,500 or more. In the quarter, global sales soared to 247,230, trailing only Toyota's Corolla, at 300,800, and Ford Motor Co.'s 277,000 Focus sales. The Prius surge, after two years of recalls and production disruptions, propelled Toyota back into the global sales lead for the first three months of the year. The hybrid line also gives the Toyota brand three of the top 10 models in the United Status so far this year, including its mid-sized Camry. "It proves Prius wasn't a fluke, that there's a long-term market for hybrids," said Eric Noble, president of the Car Lab, an automotive consultancy in Orange, Calif. In the aftermath of last year's earthquake and tsunami that cut parts and auto production for Japanese carmakers, the government in December began encouraging purchases of fuel-efficient autos to reverse sagging domestic deliveries. 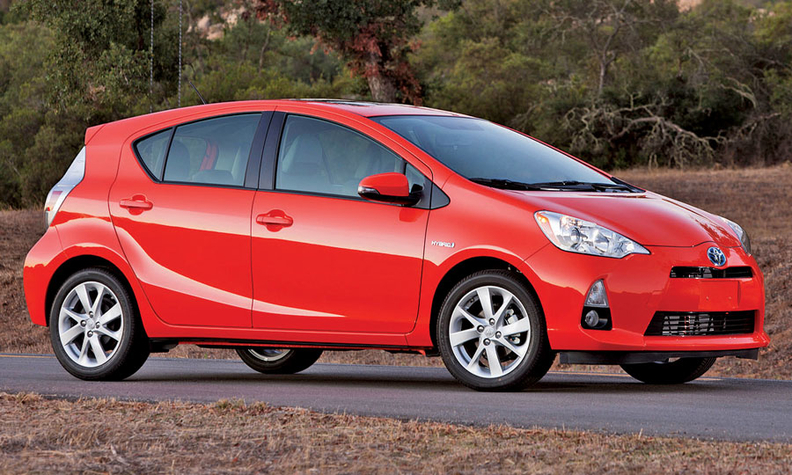 Rebates of as much as 100,000 yen ($1,258) are available from a 300 billion yen fund for qualified cars, including the Prius hatchback, wagon, plug-in and Aqua subcompact, sold in the U.S. and elsewhere as the Prius c.
Tax savings further reduce the purchase price by another 100,000 yen or more. The average price for a Prius in Japan is about 2.5 million yen and around $25,000 in the U.S.
Aqua has become the car of the moment in Japan, helping more than triple Prius family sales in the country to 175,080 in the first quarter, from 52,507 last year. While funds for the rebates may run out in July if the government doesn't extend them, the tax reductions continue through 2015. "It was good that introduction of Aqua and the start of government subsidies happened almost at the same time," said Koichi Sugimoto, senior analyst at BNP Paribas in Tokyo, who recommends that investors hold Toyota shares. He added that there's more to the success than the government incentives. "Toyota is introducing good vehicles and assuming it will maintain a certain volume even after the subsidies end," he said. The Prius line topped other high-volume car models including Hyundai Motor Co.'s Elantra, Volkswagen AG's Golf, Ford's Fiesta, General Motor Co.'s Cruze and Honda Motor Co.'s Civic, according to the companies. Toyota ranked as the world's largest automaker by sales from 2008 to 2010, before the natural disasters pared its global production and deliveries. Sales of Toyota, Lexus, Scion, Hino and Daihatsu vehicles grew 18 percent to 2.49 million in the quarter, Toyota said in a U.S. regulatory filing this month. That put it ahead of GM's 2.28 million and VW's 2.16 million, according to data compiled by Bloomberg. CEO Akio Toyoda has said the company founded by his grandfather is "turning the corner" after a couple of difficult years. The company endured record recalls in 2010 in the United States, its biggest single market, for floor-mat and gas-pedal flaws that caused unintended acceleration. "You are seeing a company that is clearly coming back," said Efraim Levy, equity analyst with Standard & Poor's Capital IQ in New York. "For Prius to sell in that kind of volume, something that's been a niche product, it's an achievement." Since the start of Prius sales in Japan in 1997, Toyota has sold 4 million hybrid-electric vehicles worldwide, including 1.5 million in the United States, the company said on May 22. In the United States, typically Toyota's top market for Prius, sales jumped 42 percent in the first quarter, and 56 percent through April to a record 86,027. U.S. sales of the model since its 2000 introduction, including the new variations, total 1.18 million vehicles, according to data compiled by Bloomberg. Global sales increased 125 percent. Prius sets a standard of success for alternatively powered cars, including Nissan Motor Co.'s all-electric Leaf and GM's Chevrolet Volt, which has a gas-burning generator on board to extend the range of the electric-drive car. The sales pace for Prius isn't likely to be matched soon by any other hybrid models, said John Wolkonowicz, an independent analyst in Boston who specializes in automotive history. "It's the phenomenon we saw with Chrysler and minivans: It brought out the first minivan and after all these years, Chrysler still is minivan sales leader," he said. "Prius was the first hybrid on the block." The Prius line's current global popularity provides marketing benefits, Wolkonowicz said. "Being No. 1 is important for advertising purposes; it provides a comfort factor that, for Prius, can be significant," he said. "It provides a 'why buy?' reason for customers who may be on the fence." The top-selling vehicle line in the United States for the past 30 years has been Ford's F-Series pickup truck, which includes F-150, F-250 and other models. Toyota's Camry has been the top-selling car in the United States for 10 years. Toyota's decision to give the car a distinctive wedge shape that some car enthusiasts dislike has also been a long-term benefit, Wolkonowicz said. "Even grandmas who don't know cars know what a Prius is," he said. The appeal of Prius has as much to with how it's now a de facto brand within Toyota, positioned as the top "green" choice, as the car's actual fuel economy, Noble said. "Prius is a Prius first and a Toyota second," he said. "The fact it's doing well this year is a reflection of the strength of the model line and the Prius brand." While the current rate suggests U.S. drivers may want to buy 250,000 or more Prius models in 2012, the region may not get more than its planned 220,000 units. "I've ordered additional production," Bob Carter, Toyota's group vice president of U.S. sales, said in a May 7 interview. "I'm confident we'll get additional production, but globally we're seeing high demand, particularly in Japan."